For 88-year old master weaver Magdalena Gamayo, there is no pleasure better than handing down her hand-weaving skills to the young. Gamayo, who lives in Barangay Lumbaan in Pinili, Ilocos Norte, began her interest in the art of weaving at age 16 through her aunt, who used to weave abel–Iluko (Ilocano hand-woven cloth) during World War II. Her skill was honed by years of constant practice and patience. Through the years, Gamayo’s abel fabrics have been recognized for its high quality and unique designs which she created from patterns such as the kusikos (spiral forms similar to oranges), inuritan (geometric design), and the most challenging sinan-sabong (flowers). 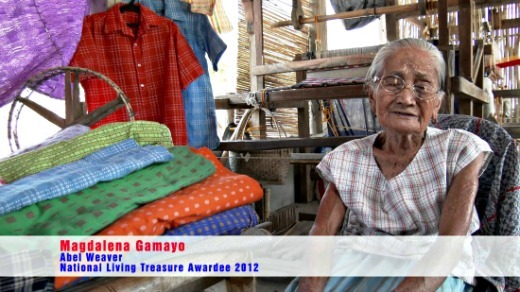 In 2012, her long-time persistence of producing attractive hand-woven cloth was finally noticed after the National Commision for Culture and the Arts (NCCA) honored her as a National Living Treasure (Gawad sa Manlilikha ng Bayan). She said she fears the art of loom-weaving will be lost if the skills are not transferred to the next generation. “I’m greatly confident that this tradition will continue even if we only earn a small amount of money. What’s important is to preserve this rich culture of the Ilocanos,” she said. “I always pray to God to (give me more years) because (I fear) when I am gone, the abel-weaving tradition might also be lost,”said added. At present, she is teaching five middle- aged women in her home to include her cousin's daughter-in-law, sister-in-law and her neighbors. She also conducts tutorials on abel- Iluko weaving in her home. Aside from her relatives and neighbors, other Ilocano weavers have taken interest in learning the techniques and method of abel-weaving that only Magdalena can do. She said patience is the most important trait that one should possess noting that abel-weaving undergoes complicated procedures and techniques. “Patience is needed in this job, because abel-weaving is really hard,” she said. Gamayo disclosed that she only starts teaching her students with other special designs when she is satisfied with the quality of their triple-toned warp Binakol, which is the first test of her lesson. “Following the complicated but attractive design is difficult but very challenging to do because just one mistake would result to a flawed design,” said 45 year-old Erlinda Gampong, one of Gamayo’s students. To sustain the local loomweaving industry in Ilocos Norte, Governor Imee R. Marcos has eyed to re-establish an Abel museum in Paoay, Ilocos Norte where all the unique and original abel masterpieces will be on exhibit. The governor has been trying to revive and improve the Ilocano heritage crafts particularly the inabel through making it innovative and sellable items such as the “Carry All Bag” a top-quality bag made of canvas and nylon-lining. On January 28, Marcos handed over the P10, 000 loans to 15 women loomweavers of Paoay town for the purchase of raw materials for attractive inabel fabrics production.